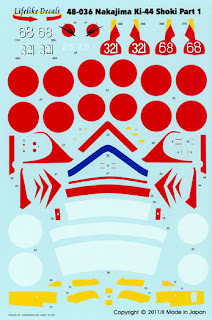 As a predominantly 1/72nd scale modeller I hope that Lifelike Decals of Japan will release their three sets of Ki-44 Shoki markings in that scale too - as they have done with other sets. Good quality aftermarket decal options for the Ki-44 in the popular quarter scale have been surprisingly thin on the ground following the series of modern Hasegawa kits of this type. Decal sheets from other manufacturers have proposed some rather curious colour combinations or stuck with old favourites. The Lifelike sets have a good mixture of better known examples updated with insightful information, together with some stunning examples not seen before. One of the qualities of the Lifelike Decals is that the narrative on the sheets is so comprehensive and provides almost a mini-reference by itself, with sources for each presentation clearly stated. There is no attempt to conceal interpretative conclusions but they are invariably soundly based and often consider viable alternatives. Japanese modellers appear much more comfortable with this, whereas many Western modellers agonise and argue endlessly over colour details that will probably never be confirmed, seeking that elusive old impostor "consensus" - a gathering of opinions, too often ill-founded. Another quality of these sheets is their printing by Cartograf - to an excellent high standard. Part 1, 48-036 provides markings for four aircraft, beginning with Lt Inayama's distinctive black-painted Shoki of the 87th Sentai which featured as the cover art by Ronnie Olsthoorn for the Osprey Ki-44 Aces book. I had the opportunity to discuss this aircraft - and others - with the owner of Lifelike, who very kindly indulged my suggestions about it. The greyish-black (anthracite) paint was thinly sprayed over the whole upper surface and this should be replicated on a model, finished first in overall natural metal, rather than just painting it black. The rudder appears to be dark green but is meant to represent the thin black paint over the original grey-green dope. It is also possible that the rudder was not over-painted on this machine. 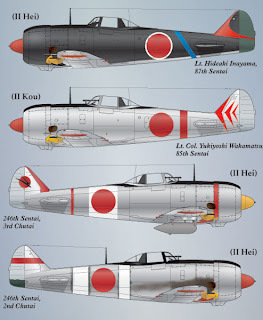 The second aircraft is a Ki-44 flown by the great China-based 85th Sentai ace Yukiyoshi Wakamatsu, "the Red-Nosed Ace", and is believed to depict the tail marking accurately for the first time. The photograph of this aircraft reveals the natural metal finish to have been oxidised and dull at the time and it may have had the forward cowling rim painted red too. Third choice is a well-known and oft-modelled 246th Sentai Shoki on Homeland Defence duty which has been depicted and discussed many times, often with some fanciful colour combinations based on that arcane art of interpreting monochrome photographs. Here we have a more realistic interpretation, no less colourful. The significance of the colour trim on the 246th machines is not fully understood in terms of Chutai and Shotai. This particular aircraft highlights the difficulties of Ki-44 variant identification conventions and the narrative touches on this. Whilst it has the cowling armament of the Hei, the optical gunsight is more usually associated with the Ko and Otsu. The profile on the sheet shows the narrow magazine access panel of the Ko whilst the photograph of the real aircraft reveals the Hei cowling armament. These unusual detail combinations need to be considered carefully if building this particular example from one of the available kits. Finally, another interesting 246th Sentai example, with two prominent white fuselage bands and carrying the revised unit marking seen on aircraft following the Phillipines campaign. This plain red tail stripe was said to represent "a loyal and sincere state of mind". 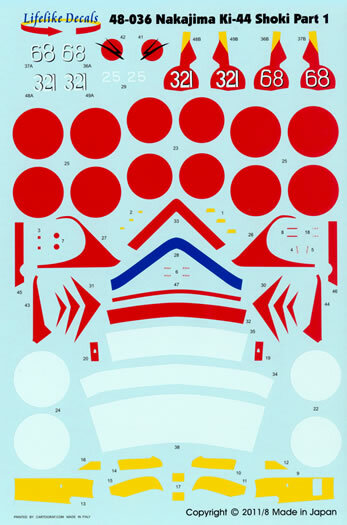 As with all the aircraft offered, the markings include the various coloured bands and undercarriage trim, but note that stencils and yellow leading-edge IFF strips are included for one machine only. These sheets retail in Japan for ¥1,500 each (about £11) but their value is considerably enhanced by the detailed information provided in the narrative and they include full upper and lower surface plan views. The recommended kit is the Hasegawa Ki-44 but the decals could probably be adapted to fit the perennially popular and simpler Arii (ex-Otaki) Ki-44 too. Thanks to Lifelike Decals for providing the review sample.